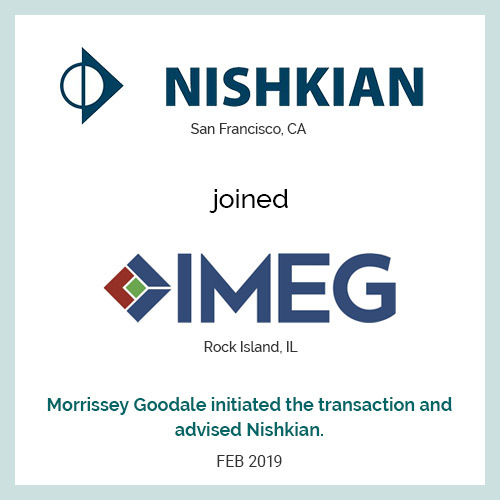 FEB 2019: Nishkian (San Francisco, CA) joined IMEG (Rock Island, IL) Morrissey Goodale initiated the transaction and advised Nishkian. FEB 2019: DPS acquired a charter corporation (pre-69) in North Carolina Morrissey Goodale advised the DPS Group. DPS acquired a charter corporation (pre-69) in North Carolina. DPS Group is a global consulting, engineering and construction management company that serves high-tech industries around the word. DPS Group has industry experts in Europe, the U.S., Asia and the Middle East. Morrissey Goodale advised the DPS Group.